Sewing Rewind: My first wearable clothing! ~ Diane's Vintage Zest! Sewing Rewind: My first wearable clothing! First of all, I wanted to thank everyone who has been amazing with comments and emails of support and compliments. I am certainly having a lot of "aw-shucks" moments lately! Also, I updated my previous post here to include (slightly) better pictures of my Christmas dress, "fur" wrap, and NYE dress. So for today, I thought I would share some of the first garments that I actually wore in public. The first time I wore each of these items, I thought that either everyone would point and laugh or that it would completely disintegrate like a paper doll dress. Luckily none of these things have happened, and I even had a couple of compliments! Victory! Remember, I first began sewing in April and for the first several weeks I did a bunch of beginner projects (pillow cases, binder covers, etc.). Then, I moved on to my first dress which I will blog about later. It was a trial for a lot of techniques, but I knew I wouldn't wear it anytime soon. By the time I finished, it was the end of June and I was in need of a fun summer dress! I only decided to attempt a maxi dress because my sister (who is as short as I am) told me about how it actually made her look taller. Sold! 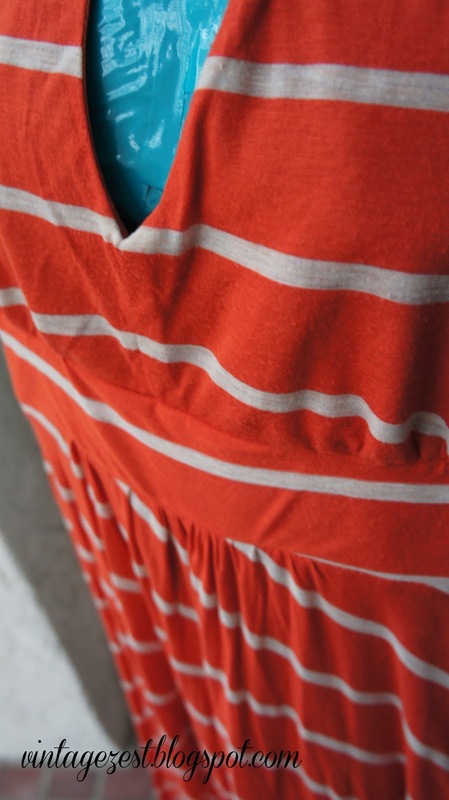 I decided to use Simplicity 3503 and an orange stretch jersey with white stripes bought at the swap for $1/yard. Because it had stripes, I didn't want to resemble a jailbird, referee, Waldo, etc. so I decided to cut the skirt with the stripes running diagonally at the bias. I'm thrilled at how it turned out! 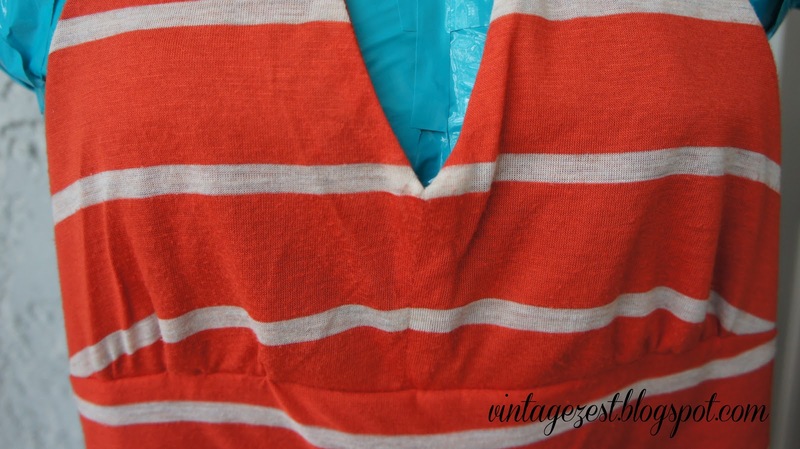 I'm especially proud of the way I matched up the stripes in the middle of the bodice. Hard to tell, right? 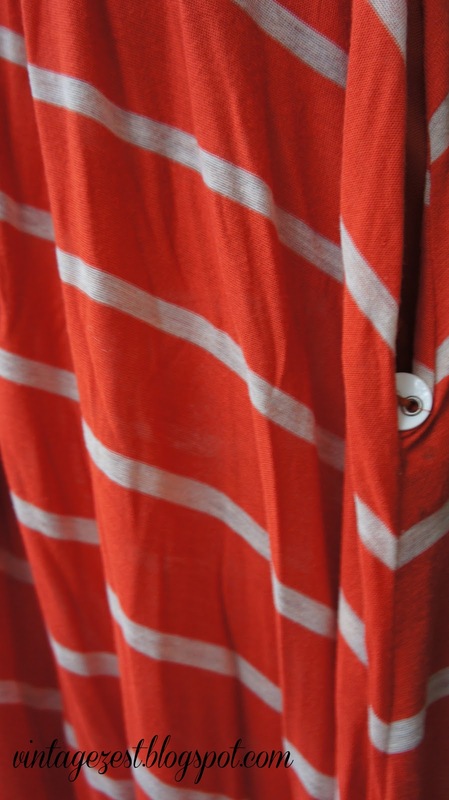 Also, the stripes match up at the side seams as well, which you can see in a later picture. By the way, I just hung the dress over my dress form which is why the fabric is pulling away. It actually fits really well! The only time matchy-matchy is a good thing! And for comparison, here is the pattern using the bottom left view. I wanted to be able to wear wedges with the dress, so it was hemmed pretty low. However, I thought that if I was wearing flip-flops and needed to run around that I should somehow be able to bring the dress up hands-free. Hidden button in the pocket. Matched up stripes on the side seam! I really love this dress! I received lots of compliments last summer, and it looks put together while still being super comfy. I can't wait until next summer! I already have another short version cut out because the bodice fits me with no alterations, and it will be my first time attempting a pattern twice! 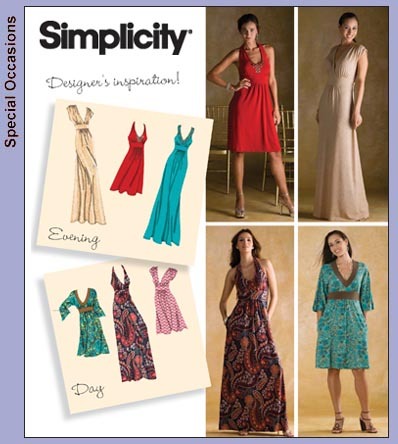 My friend introduced me to Colette patterns even before I started sewing. I was in love. 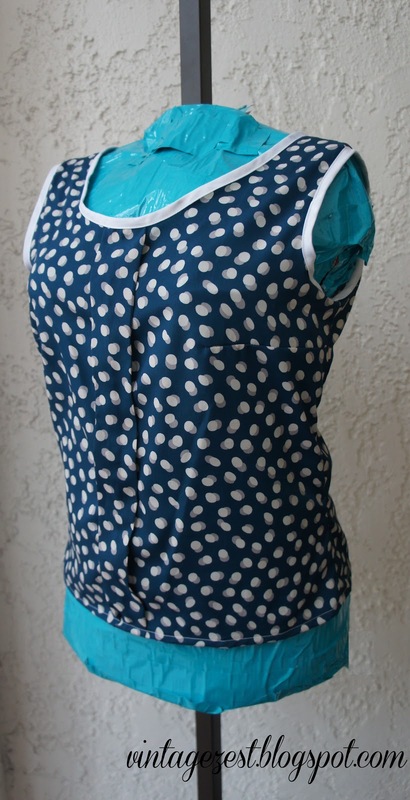 Then when I actually learned how to make a couple of garments, I went back to the website and found the free Sorbetto pattern. There are a million variations of this EVERYWHERE! I had never made anything with a printed pattern, so it was fun to piece together the puzzle before making the garment. I had also never worked with bias tape, so it was a learning experience. For the fabric, a drapey polka dot fabric (no idea what kind) for $1/yard and white bias tape for $1/4 yards. Another project under $2! A close-up of the pleated front. The verdict is that I would easily make this top again. There are so many variations that there is no way to become bored with the pattern. However, I would not use this fabric because it was not at all breathable, which an easy shirt like this needs. Also, my bias tape technique has improved since then, so I would expect less gaping at the neckhole next time. 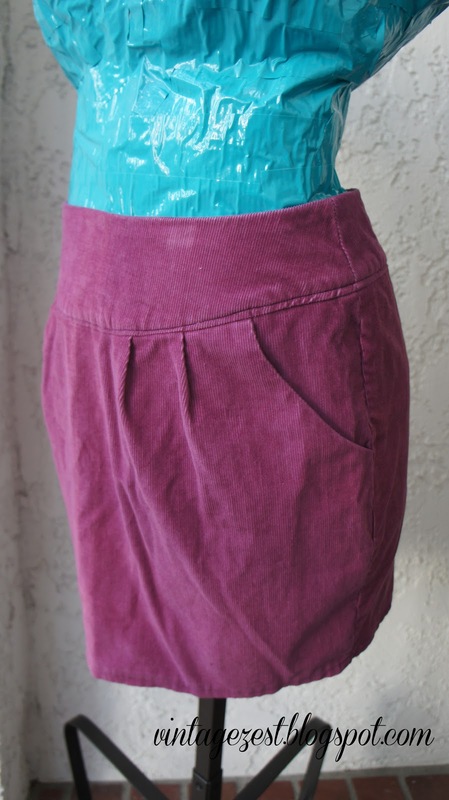 By the time I made this skirt, I had made 3 dresses, 2 tops, 1 pair of shorts, and seemingly countless crafts & pouches. It seemed natural to make a skirt next! I had bought a small piece of corduroy from a Sewer's Guild yard sale for $1 and knew I could only had enough for a short skirt. I used a zipper with metal teeth bought from the swap meet (5/$1), to make a total of less than $2. I used Simplicity 2451 View D (minus the decoration) for my skirt. In reality, the skirt ended up a bit bigger than I would have liked, but that made it easier for me to tuck sweaters into it and show off the waistband. I probably should have ironed out the wrinkles near the hem & in the waistband! I still can't believe I've made this article of clothing! Maybe it's because I assumed corduroy would be hard to sew that I am amazed how easy this came together in a few hours. Also, I think it looks like it could be bought at a store, so that's a win for me! Did anyone else have that nervous feeling the first time they wore a homemade garment in public? Or was it just me being overly nervous!